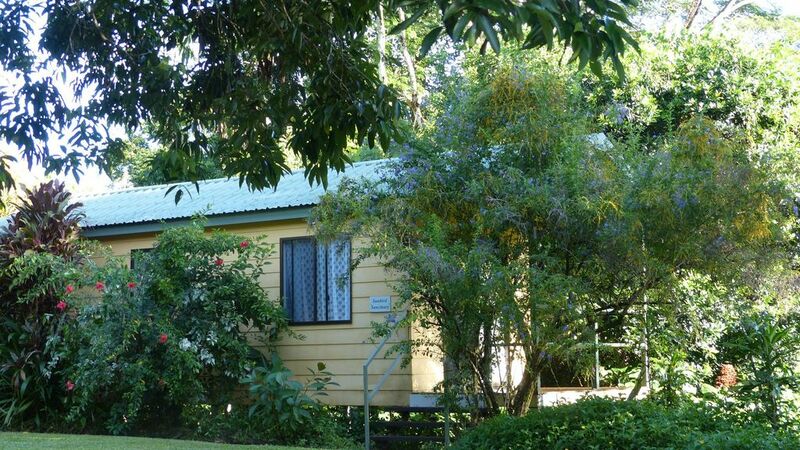 Beautiful 30 acre property in the lovely Daintree River valley with three very private self-contained, air-conditioned B&B bungalows overlooking a fresh-water lagoon and rainforest. Tropical fruit trees, colourful gardens, walking/jogging trails, home to hundreds of birds and butterflies - a bird- and nature-lover's Paradise, honeymooners' haven or the perfect hideaway for a relaxing interlude. Each bungalow has either a King/Twin or Queen bed plus convertable sofa for one extra adult - please request your preference when booking. All have lagoon and rainforest views from their verandahs and each accommodates a maximum of 3 adults. There is an ensuite bathroom with large shower, kitchenettes have a microwave, cooktop, fridge and all cooking utensils, there is a timber dining setting, they are air-conditioned and insect-screened and there is a ceiling fan. The Shed is an historic old timber building where you will find a gas barbeque and table, jacuzzi spa, dart-board and a selection of books and games. If you need to keep in touch free wifi is available in The Shed. The rate includes a daily breakfast basket (delivered to your bungalow the previous afternoon) of tropical fruits, juice, cereals, home-made jam and yoghurt, locally-grown freshly-ground coffee and Daintree tea. Enjoy 'breakfast with the birds' at your leisure on your verandah. For other meals guests may choose to bring their own supplies - a small menu of self-cook meals, wine, beer and soft drinks is available, and there are several restaurants in Daintree Village (8km). Daintree Valley Haven is at the end of a winding trail through the stunning Stewart Creek Valley, 8km beyond Daintree Village. There is very little public transport throughout the Daintree region and guests must have their own transport to reach Daintree Valley Haven. Stewart Creek Road is not sealed but is well-maintained by the local council and suitable for normal cars. Scenic drives through Daintree National Park and the Daintree River valley. Property is set on 30 acres of tropical gardens, rainforest and fruit trees. Walking/jogging trails around the property. Far more than just a place to stay! This is IT! We didn't have particularly high hopes for our Daintree Valley Haven stay. We just wanted a base from which to do our adventures to the Bloomfield track, Cape Tribulation, and all the other things to do there. We ended up enjoying the Peter and Daphne's Daintree Valley Haven most of all! Peaceful, beautiful Daintree rain-forests with bushwalks. The blue Ulysses butterflies, the bandicoots coming out at night. Simply wonderful. We loved our stay at Daintree Valley Haven..it was very peaceful relaxing and loved the bird life..if you need to chill out and unwind from your day to day life this is the place to do it..not to mention the host Peter and daphne are very friendly very welcoming and very down to earth...the breakfast basket was very nice and very fulfilling..would definitely recommend it to everybody. Thank you very much indeed for your lovely comments and we're delighted to hear you enjoyed your stay with us. Location and easy people to deal with! meetiing daphne and peter was great. we envy thier situation. great local place to stay. It's hard to differentiate which was better - The personal service of the hosts or the harmony and tranquility of the environment. We loved the peaceful atmosphere, sitting on the front porch enjoying the delicious breakfast and the abundance of wildlife. The availability of meals to cook was a real bonus as well - a particularly thoughtful idea given the distance to shops. Why would anyone want to leave to find a meal?